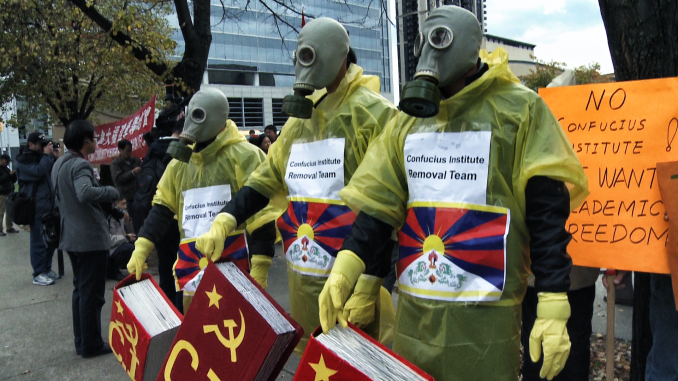 Protesters from the Tibetan community rally against the Confucius Institute in front of the Toronto District School Board, in October 2014. The Confucius Institutes (CIs), ostensibly benign Chinese language and cultural agencies, are funded and overseen by the Beijing party-state through an office commonly known as Hanban, but are physically embedded in foreign universities and schools. There are today about 513 institutes and 1,074 Confucius Classrooms in 140 countries on five continents, including about 30 in Canada and 450 in the U.S. The government of China has, since 2004, spent more than $2 billion US to support them. Typically, a host institution receives $100,000-$150,000 yearly from Beijing to run Confucius Institute (CI) programs, plus cost-free Chinese instructors and textbooks. There are free trips to China for administrators and opportunities to recruit more Chinese students, who often contribute significantly to the revenues of educational institutions outside China. 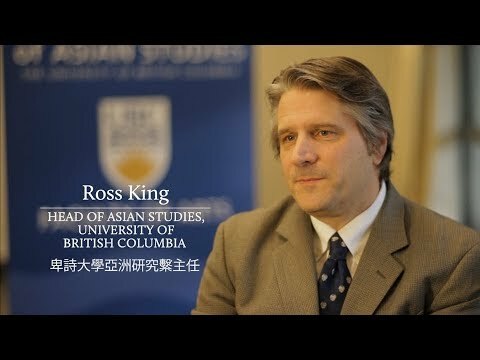 In 2013, McMaster University in Hamilton became the first university in North America to close its CI after a five-year term.“Concerns were raised that the hiring decisions in China did not reflect the practices of the university,” McMaster stated in its announcement. Specifically, CIs ban practitioners of Falun Gong, an exercise and meditation movement that has been persecuted brutally across China since 1999, from being CI instructors. Sonia Zhao, then 25, was permitted to teach at McMaster’s CI only after she signed a hiring contract with Hanban, which included a clause: “No participation in illegal activities such as Falun Gong.” In fear of being identified as Falun Gong, which she was, Zhao signed without comment. When she completed her contract, she sought asylum in Canada, telling her story to Ontario’s Human Rights Tribunal. “McMaster University is giving legitimatization to discrimination and opening its campus to more infringements of their own policies,” Zhao wrote. McMaster decided to close its CI when Hanban refused to rescind the policy under which tens of thousands of instructors such as Zhao have been recruited and sent across the world. 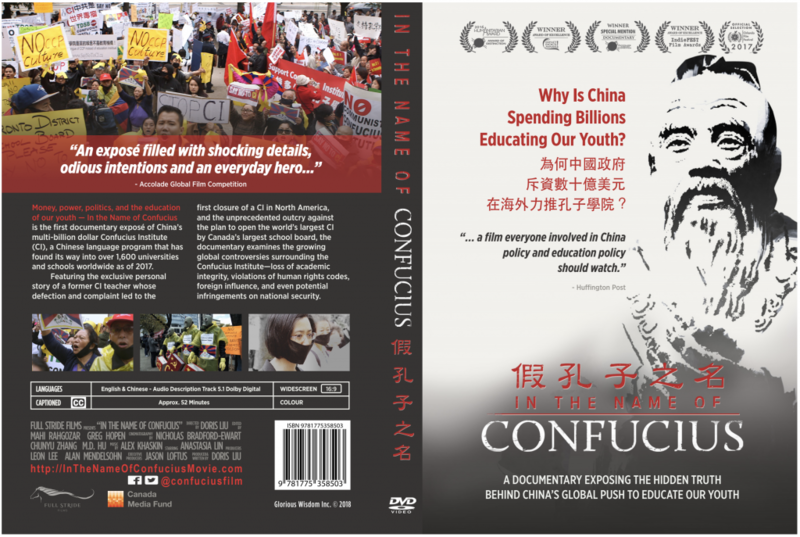 McMaster and Zhao are featured in a new Canadian documentary film, In the Name of Confucius, directed and produced by Doris Liu, co-author of this piece, who was born in China, but now lives in Canada. Liu also followed the five-month-long protest against the Toronto District School Board’s (TDSB) plan to open the world’s largest CI. In 2014, trustees were provided with samples of party-state propaganda in teaching materials used by CIs, including songs praising the Communist Party and its erstwhile leader, Mao Zedong (who is documented as loathing Confucius). The trustees heard Zhao’s story, including how she was trained by Hanban to avoid topics such as Tibet and Taiwan, and to give the Beijing party-line if she could not change a discussion topic. 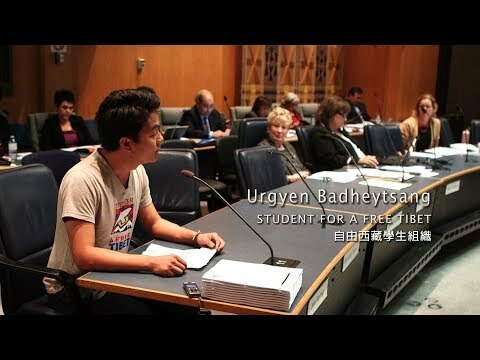 In a public hearing, a Tibetan student whose father was shot by the People’s Liberation Army told trustees that the CI director at Brock University would not allow a Tibetan student to display a Tibetan flag at an event to celebrate various nationalities on campus. The Coquitlam School District in British Columbia held an exhibition about beautiful “new” Tibet, where the photos on display were all taken by the party-state’s Xinhua News Agency. School officials told Liu in an interview that they visited China four or five times a year and received $1 million worth of gift books when its CI opened. The University of Maryland, the first university in the U.S. to host a CI, held an exhibition on Tibet at which a Chinese diplomat attacked the much-admired Dalai Lama in his speech. James Turk, former executive director of the Canadian Association of University Teachers (CAUT), told Liu that CAUT asked the Canadian CI host universities and colleges for their agreements with Hanban, but failed to obtain a single one. Liu’s efforts to interview officials of seven CI host institutions in Ontario and B.C. were met with rejections or with interviewees walking away when asked probing questions. Brock University asked Liu to sign a media consent that gave the university the right to pre-screen and withdraw any interview content it deemed inappropriate. When Liu refused to sign, Brock cancelled her interviews. 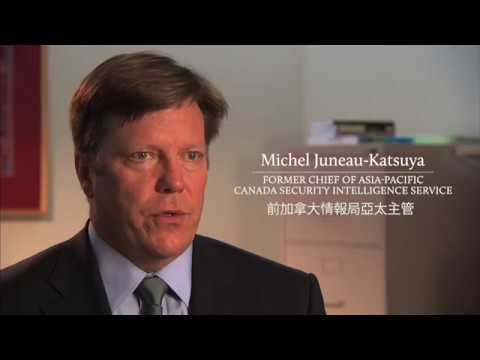 In her documentary, Liu interviewed scholars and China experts, including Michel Juneau-Katsuya, former Asia-Pacific chief of the Canadian Security and Intelligence Service (CSIS), who warned TDSB trustees at a public hearing that CIs have been used by the Chinese government as a tool of “soft power” and as a spy agency, and that certain CIs in Canada were under investigation . This is an excerpt of the Diplomat Magazine article. To read the entire article please click here.